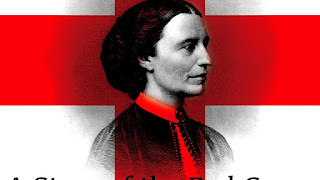 Clarissa "Clara" Harlowe Barton (December 25, 1821 - April 12, 1912) was a pioneering nurse who founded the American Red Cross. She was a hospital nurse in the American Civil War, a teacher, and patent clerk. Nursing education was not very formalized at that time and Clara did not attend nursing school. So she provided self-taught nursing care. Barton is noteworthy for doing humanitarian work at a time when relatively few women worked outside the home. She had a relationship with John J. Elwell and received three proposals throughout her lifetime, but never married. Clara Barton was born on December 25, 1821, in North Oxford, Massachusetts. Barton's father was Captain Stephen Barton, a member of the local militia and a selectman who inspired his daughter with patriotism and a broad humanitarian interest. Barton's mother was Sarah Stone Barton. When Clara was 10, she assigned herself the task of nursing her brother David back to health after he fell from the roof of a barn and received a severe injury. Clara learned how to distribute the prescribed medication to her brother, as well as how to place leeches on his body to bleed him (a standard treatment at this time). She continued to care for David long after doctors had given up. He made a full recovery. Her parents tried to help cure her shyness by sending her to Col. Stones High School, but their strategy turned out to be a disaster. Clara became more timid and depressed and would not eat. She was brought back home to regain her health. Upon her return, her family relocated to help a family member: a paternal cousin of Clara's had died and left his wife with four children and a farm. The house that the Barton family was to live in needed to be painted and repaired. Clara was persistent in offering assistance, much to the gratitude of her family. After the work was done, Clara was at a loss because she had nothing else to help with, to not feel like a burden to her family. She began to play with her male cousins and, to their surprise, she was good at keeping up with such activities as horseback riding. It was not until after she had injured herself that Clara's mother began to question her playing with the boys. Clara's mother decided she should focus on more feminine skills. She invited one of Clara's female cousins over to help develop her femininity. From her cousin, she gained proper social skills as well. To assist Clara with overcoming her shyness, her parents persuaded her to become a schoolteacher. She achieved her first teacher's certificate in 1839, at only 17 years old. This profession interested Barton greatly and helped motivate her; she ended up conducting an effective redistricting campaign that allowed the children of workers to receive an education. Successful projects such as this gave Clara the confidence needed when she demanded equal pay for teaching. In 1852, Clara Barton was contracted to open a free school in Bordentown, which was the first ever free school in New Jersey. She was successful, and after a year she had hired another woman to help teach over 600 people. Both women were making $250 a year. This accomplishment compelled the town to raise nearly $4,000 for a new school building. Once completed, though, Barton was replaced as principal by a man elected by the school board. They saw the position as head of a large institution to be unfitting for a woman. She was demoted to "female assistant" and worked in a harsh environment until she had a nervous breakdown along with other health ailments, and quit. In 1855, she moved to Washington D.C. and began work as a clerk in the US Patent Office; this was the first time a woman had received a substantial clerkship in the federal government and at a salary equal to a man's salary. For three years, she received much abuse and slander from male clerks. Subsequently, under political opposition to women working in government offices, her position was reduced to that of copyist, and in 1856, under the administration of James Buchanan, she was fired because of her "Black Republicanism." After the election of Abraham Lincoln, having lived with relatives and friends in Massachusetts for three years, she returned to the patent office in the autumn of 1861, now as temporary copyist, in the hope she could make way for more women in government service. On April 19, 1861, the Baltimore Riot resulted in the first bloodshed of the American Civil War. Victims within the Massachusetts regiment were transported to Washington D.C. after the violence, which happened to be Clara Barton's home at the time. Wanting to serve her country, Barton went to the railroad station when the victims arrived and nursed 40 men. Barton provided crucial, personal assistance to the men in uniform, many of whom were wounded, hungry and without any supplies besides what they carried on their backs. She began helping them by personally taking supplies to the unfinished Capitol Building where the young men of the 6th Massachusetts Militia, who had been attacked in Baltimore, Maryland, were housed. In 1864, she was appointed by Union General Benjamin Butler as the "lady in charge" of the hospitals at the front of the Army of the James. Among her more harrowing experiences was an incident in which a bullet tore through the sleeve of her dress without striking her and killed a man to whom she was tending. She was known as the "American Nightingale." She was also known as the "Angel of the Battlefield" after she came to the aid of the overwhelmed surgeon on duty following the battle of Cedar Mountain in Northern Virginia in August 1862. She arrived at a field hospital at midnight with a large amount of supplies to help the severely wounded soldiers. This naming came from her frequent timely assistance as she served troops at the battles of Fairfax Station, Chantilly, Harpers Ferry, South Mountain, Antietam, Fredericksburg, Charleston, Petersburg and Cold Harbor. Barton achieved widespread recognition by delivering lectures around the country about her war experiences in 1865-1868. During this time she met Susan B. Anthony and began a long association with the woman's suffrage movement. She also became acquainted with Frederick Douglass and became an activist for civil rights. After her country wide tour she was both mentally and physically exhausted and under doctor's orders to go somewhere that would take her far from her current work. She closed the Missing Soldiers Office in 1868 and traveled to Europe. In 1869, during her trip to Geneva, Switzerland, Barton was introduced to the Red Cross and Dr. Appia; who later would invite her to be the representative for the American branch of the Red Cross and even help her find financial beneficiaries for the start of the American Red Cross. She was also introduced to Henry Dunant's book A Memory of Solferino, which called for the formation of national societies to provide relief voluntarily on a neutral basis. The society's role changed with the advent of the Spanish-American War during which it aided refugees and prisoners of the civil war. Domestically in 1884 she helped in the floods on the Ohio river, provided Texas with food and supplies during the famine of 1887 and took workers to Illinois in 1888 after a tornado and that same year to Florida for the yellow fever epidemic. Within days after the Johnstown Flood in 1889, she led her delegation of 50 doctors and nurses in response. In 1897, responding to the humanitarian crisis in the Ottoman Empire in the aftermath of the Hamidian Massacres, Barton sailed to Constantinople and after long negotiations with Abdul Hamid II, opened the first American International Red Cross headquarters in the heart of Turkey. Barton herself traveled along with five other Red Cross expeditions to the Armenian provinces in the spring of 1896, providing relief and humanitarian aid. Barton also worked in hospitals in Cuba in 1898 at the age of seventy-seven. Barton's last field operation as President of the American Red Cross was helping victims of the Galveston hurricane in 1900. The operation established an orphanage for children. As criticism arose of her mixing professional and personal resources, Barton was forced to resign as president of the American Red Cross in 1904, at the age of 83 because of her egocentric leadership style fitting poorly into the formal structure of organizational charity. She had been forced out of office by a new generation of all-male scientific experts who reflected the realistic efficiency of the Progressive Era rather than her idealistic humanitarianism. After resigning, Barton founded the National First Aid Society. She continued to live in her Glen Echo, Maryland home which also served as the Red Cross Headquarters upon her arrival to the house in 1897. Barton published her autobiography in 1907, titled The Story of My Childhood. On April 12, 1912 at the age of 90, she died in her home. The cause of death was tuberculosis. In 1997, General Services Administration carpenter Richard Lyons was hired to check out the building for its demolition. He found a treasure trove of Clara Barton items in the attic, including signs, clothing, Civil War soldier's socks, an army tent, Civil War-era newspapers, and many documents relating to the Office of Missing Soldiers. This discovery led to the NPS saving the building from demolition. It took years, however, for the site to be restored. The Clara Barton's Missing Soldiers Office Museum, run by the National Museum of Civil War Medicine, opened in 2015. In the NBC TV series Voyagers! (1982-1983), Phineas Bogg and Jeffrey Jones travel through time to make sure history proceeds correctly. In the episode "The Travels of Marco ... and Friends", season 1, episode 9, original airdate December 3, 1982, Phineas and Jeffrey rescue Clara Barton (Patricia Donahue) from a burning wagon, but she is on the verge of succumbing to smoke inhalation. Jeffrey (a young boy from 1982) applies mouth-to-mouth resuscitation (a technique unknown in Barton's time) and saves her life, thus enabling her to go on to found the American Red Cross.